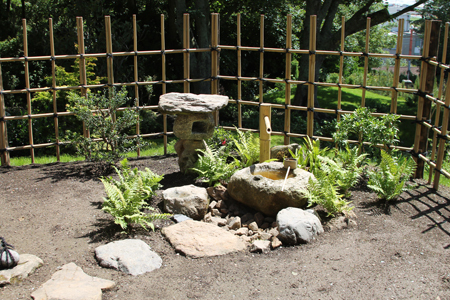 ”The Lafcadio Hearn Japanese Gardens have been established on the site of the former gardens of Tramore House, which had fallen into disrepair. This location is adjacent to the centre of the old town of Tramore. 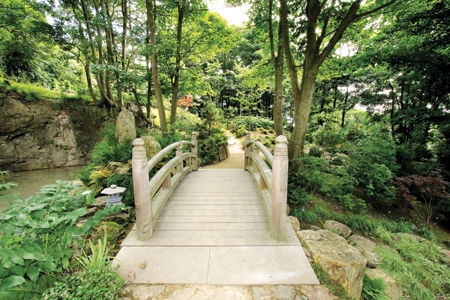 The gardens commemorate the life and work of the Irish/Greek author Lafcadio Hearn, who achieved international fame as a writer in Japan in the 1890-1904 period. 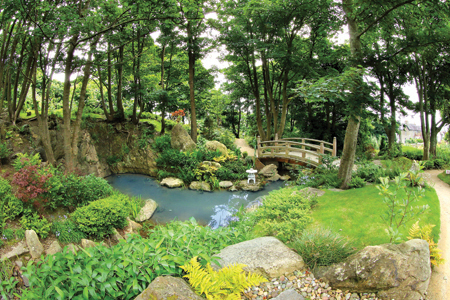 The idea for these gardens first arose in 2012 when Professor Bon Koizumi , the great grandson of Lafcadio Hearn, with his wife, Shoko, visited Tramore to retrace the steps of his famous ancestor who had spent his childhood summers in Tramore. The concept was developed by the Lafcadio Hearn Advisory Board in conjunction with Tramore Development Trust and Waterford City and County Council. Financial support was obtained from Waterford Council, the Japanese JEC Fund and a number of commercial business concerns, both Irish and Japanese. Contact was maintained with the Koizumi family who were supportive of the project throughout. Construction commenced in June 2014 and was largely completed by June 2015 when the gardens were formally opened. The overall garden layout was developed by Martin Curran, who also managed the construction. The Victorian and American Gardens were designed by Laura Cassin. The ornamental timber structures were designed by Mike Roberts. The gardens were constructed by members of the Tramore Community Employment (CE) Scheme, supported by the Department of Social Protection. Further additions to the garden are planned in 2017. These include two new ornamental garden buildings: an Azumaya which will be constructed to overlook the lily pond; and an Ochaya, or Japanese ceremonial teahouse, which will overlook the stream, bridge and upper reaches of the gardens. The gardens are managed by Tramore Development Trust, with the support of Pobal (CSP) and the Tramore CE Scheme.